Winter is usually a sedentary time for you and your dog. With fewer physical activities to try with your pet, winter time can become quite a challenge, exercise-wise. If you happen to have a high-energy dog who love to pull, plow, and play through and around snow, then skijoring may be a nice activity to try this season. What the heck is skijoring, you ask? Here’s what you need to know about this winter exercise that can be a blast for both dogs and their owners. Skijoring comes from Norwegian countries where cross-country skiing is popular. 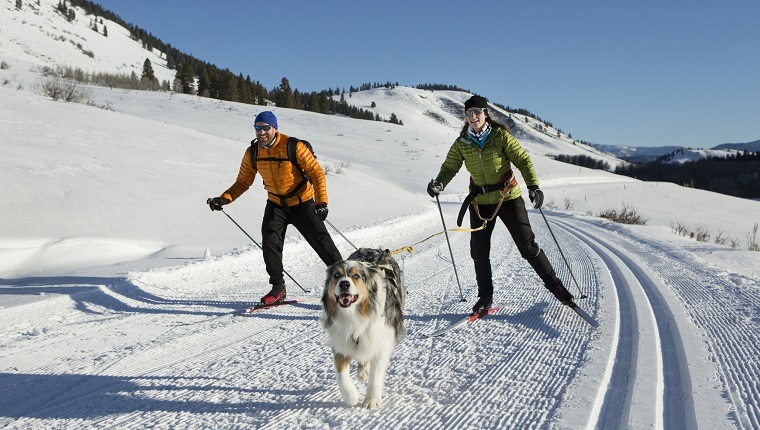 This activity sort of combines cross-country skiing with dog walking or running. The owner is on skis, and the dog pulls ahead with a lead attached to a harness. The dog isn’t doing all the work, though. The owner needs to keep up, or they might get taken for a wild ride–or get launched face-first into the snow–by a pup with too much enthusiasm. It helps to have a background in skating when it comes to more informal enjoyment of skijoring. It can help beginners stay balanced and learn the motions. Jill Carter, who has been skijoring for the past six years, started out with the basic moves of skiing. She adopted the skater’s method that propels the skier side to side while moving forward. For her, this is the best method to keep up with dogs who run fast. Compared to dog sledding, which could become taxing for the dog if left unchecked, skijoring puts more effort on the dog owner. That’s because dogs will basically run forward unless distracted, and it’s the owner’s task to ski with the dog instead of waiting to be fully pulled forward. “The key to enjoying skijoring is having a dog that is trained. The better trained your dog is, the better run you will have,” said Carter. Can Your Pet Enjoy Skijoring? For most people, any dog in optimal health can supposedly enjoy skijoring with their owner. But the reality is that some breeds can better participate in this activity than others. Northern dog breeds like Huskies, Malamutes, Samoyeds, Chow-chows, and Canadian Eskimos can handle the longer runs in the snow. Larger dog breeds like American Bulldogs, Mastiffs, Staffordshire and American Terriers, Retrievers, and German Shepherds can also enjoy skijoring. Small dog owners should not force their pets to participate. Always consider if your pet is the type to play fetch or if they prefer less strenuous activities. This is why smaller dogs like Chihuahuas and Shih Tzus and their owners would probably enjoy watching skijorers from the sidelines and cheering them on. You must also ensure that your dog is the type to pull and run, though training can make those activities more fun for dogs. It’s also good if they enjoy the cold weather. Don’t forget to protect your pet from the harsh weather with the right gear before diving into skijoring! Do you think your pup would enjoy skijoring? Will it make a nice exercise the next time you are in a winter adventure park? Let us know in the comments below!